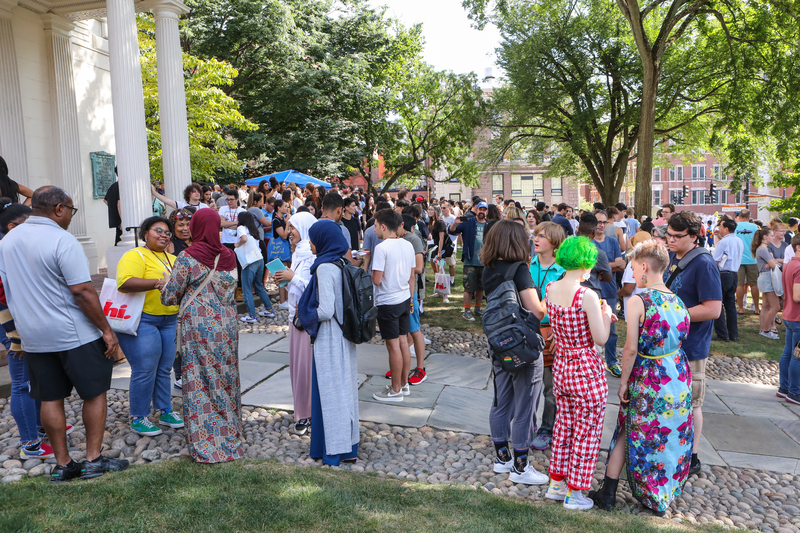 New student orientation is in full swing, with 473 first-year students and 221 new graduate students joining RISD’s unique learning community. Incoming students are participating in such programs as Project Thrive (for first-generation college students), POSE (the Pre-Orientation Service Experience) and International Student Orientation. Led by the Center for Student Involvement (CSI) with support from the RISD Dining and Facilities teams, orientation offers a whirlwind of fun, new friends, information sharing and foundation building. 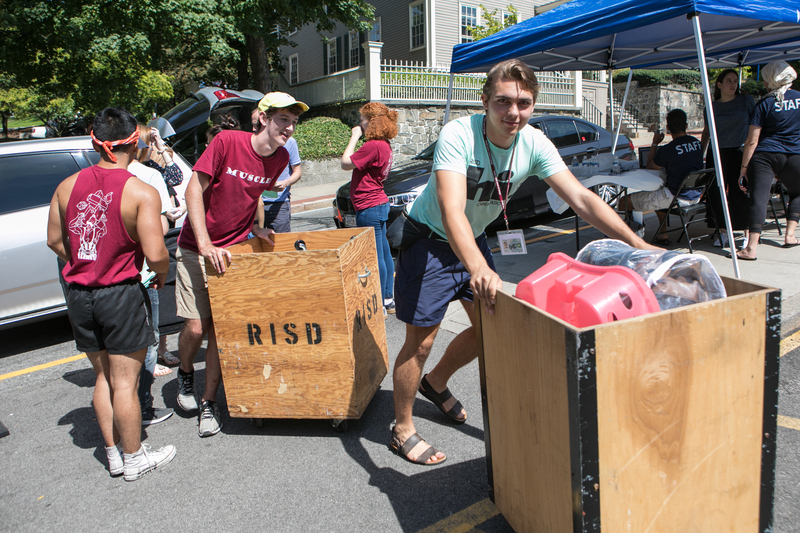 RISD Muscles and orientation leaders lend a hand on move-in day. 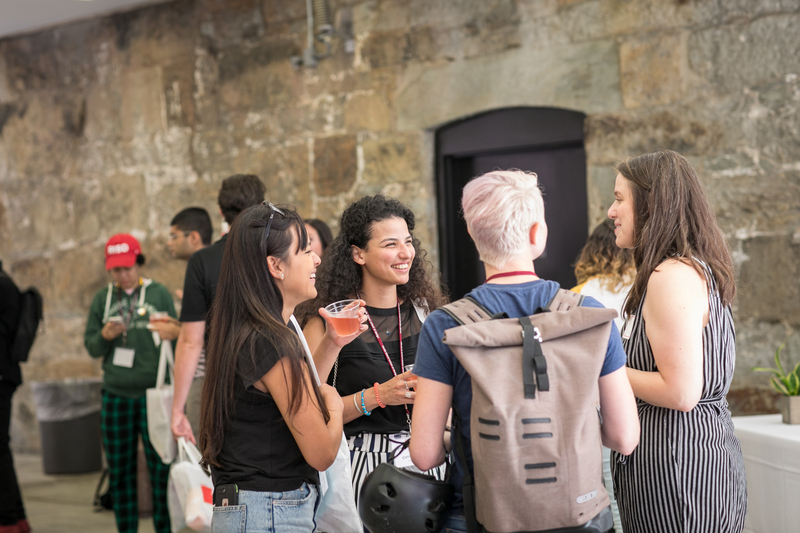 It’s worth noting that this year’s crop of incoming students had built a strong foundation for themselves long before arriving at RISD, with impressive credentials and interesting backgrounds. The class of 2022 boasts an average SAT score of 1305 and average GPA of 90.2. Among the incoming graduate, transfer and first-year cohorts, eleven incoming students are fluent in four languages and 41% are international, with the furthest-traveled hailing from Southbank, Australia—an incredible 10,495 miles away from Providence. For international graduate and undergraduate students, orientation began a few days earlier with sessions about studio and critique culture in the context of American art and design schools. New international students explored Providence, discovered valuable resources such as the Center for Arts & Language and took in advice from fellow international students like Yan Diego Wilson 20 PT, who is serving as an international orientation leader for the second year in a row. A crowd of incoming students and their families gather before President Somerson’s welcome address. New graduate students get to know each other. When asked what’s surprised her the most about RISD so far, first-year student and Detroiter Tamia Jackson 22 EFS bemoaned an experience familiar to all who cross campus: “The hills! I had no idea. And we got here before the Muscles were out.” (RISD Muscles are the upperclass volunteers who lend a hand on move-in day.) Jackson and her fellow midwesterners make up 5% of the class of 2022, while 29% is comprised of students from the northeast. No matter their provenance, all first-year students took part in learning sessions that covered topics such as health, wellbeing, consent and relationships. They toured the museum, participated in RISD traditions for the first time and took in the words of the Reverend Dr. Jamie Washington, who returned to campus to give an inspirational and interactive talk about inclusion on campus. First-year students participate in a half day of service at Billy Taylor Park on the East Side of Providence. At Convocation on Tuesday, September 3, President Rosanne Somerson 76 ID emphasized the value of interconnectedness and the importance of observing and honoring the ways in which systems of nature sustain one another. 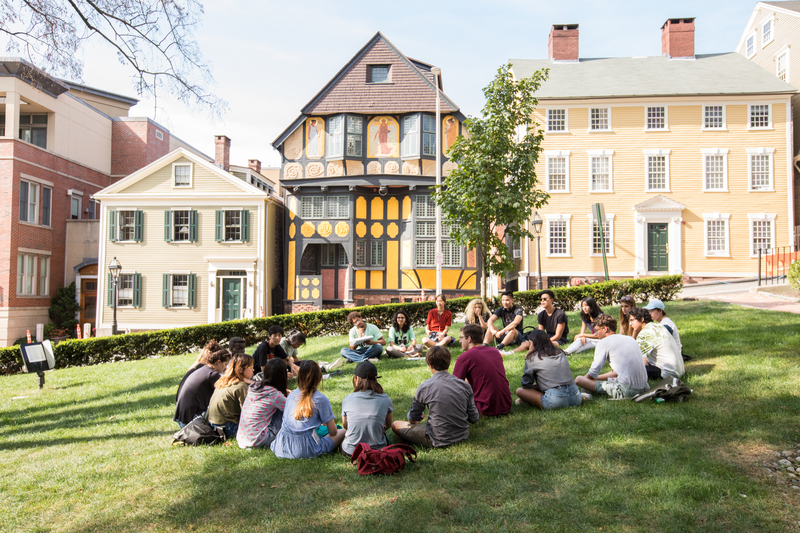 It was an apt metaphor for orientation itself: a period when students take time to absorb the small, practical details of life on campus as well as the broader opportunities available to them at RISD and beyond. One last hug before the semester kicks off. Students also embraced this spirit of connection through service learning. This year CSI built upon its popular POSE program by scheduling a half day of service open to all interested students. POSE leader (and former “POSE-r,” as alums of the program call themselves) Liviah Yeaw 21 TX—who headed up a team painting the railings at Billy Taylor Park on the East Side of Providence on Wednesday—noted that, “you definitely get to know the city better and get to give back to the community” by taking part in RISD service initiatives. An orientation group circles up on the lawn of the First Baptist Church. 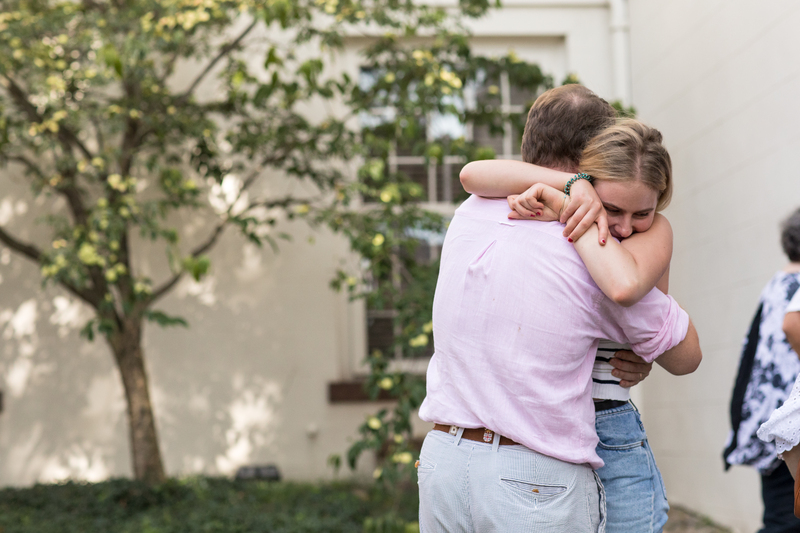 As 768 new students arrive on campus, Orientation leaders and others encourage them to make connections and consider context. 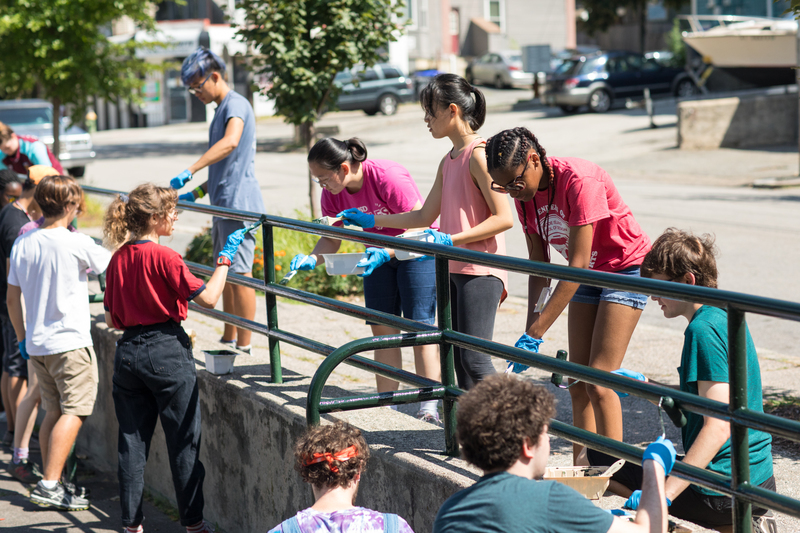 Incoming students who signed up for this year’s Pre-Orientation Service Experience (POSE) learned about the needs of off-campus communities by volunteering at local nonprofits. Kneeling on a concrete slab covered with splinters and wood dust, new student Kathryn LaMontagne 18 FS lays down her paintbrush to inspect a large wooden box with a circular hole at the top.